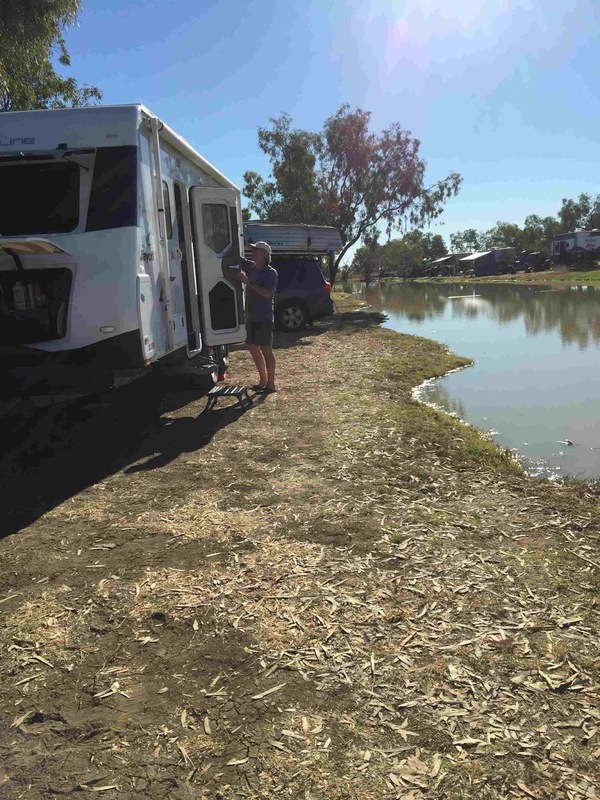 After Combo waterhole we travelled to Kynuna, on the Diamantina River, only a few kms away. Not a lot there. 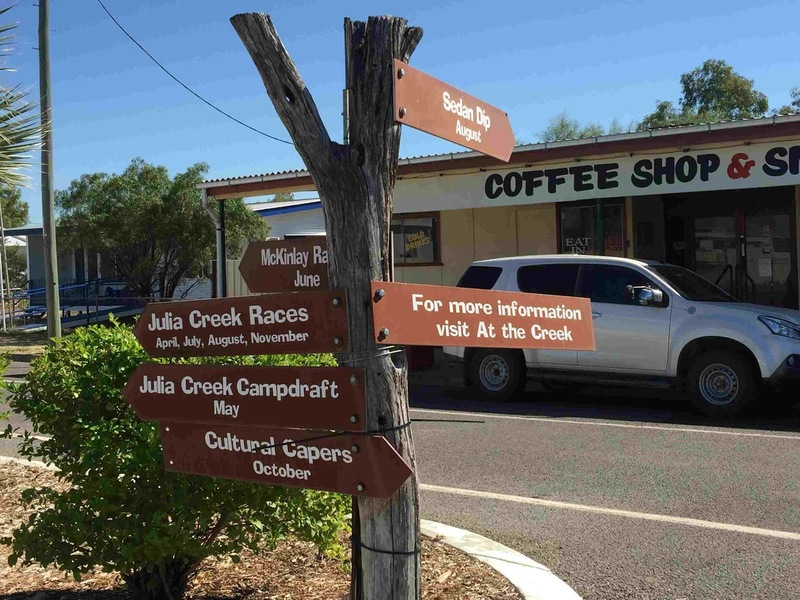 Originally the Wanamara lands, the town was established as a shearer's union camp, near a supply point, and named after Kynuna Pastoral Station (established 1878). The Post Office was opened in 1883, and the town was gazetted in 1894. 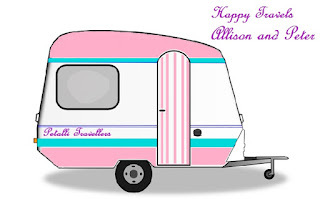 Banjo Paterson was engaged to local girl Sarah Riley, and visited the area often. This was where he got the inspiration to write Waltzing Matilda. We should have continued along the Landsborough Hwy to McKinley to see the Crocodile Dundee Hotel but that will have to wait for another trip. 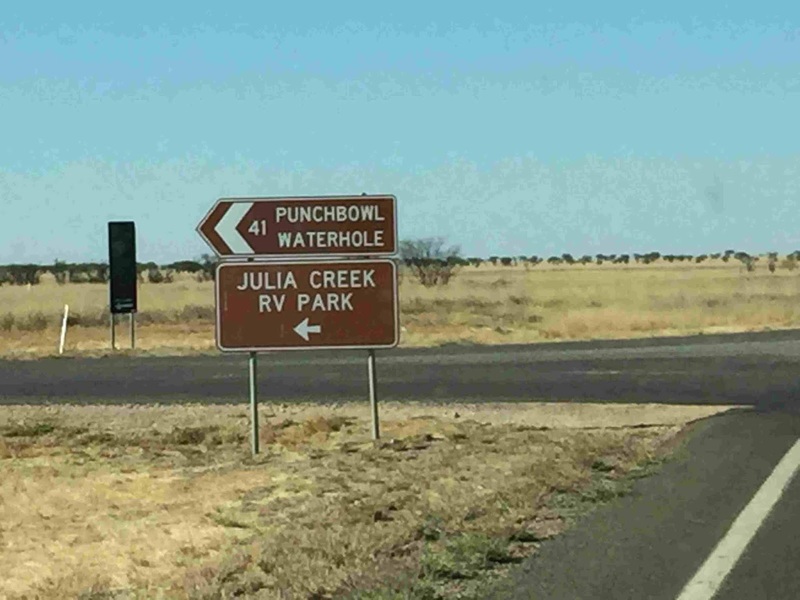 From Kynuna, Julia Creek is 115km on a new fully sealed road. We headed for the free RV park right on the creek. 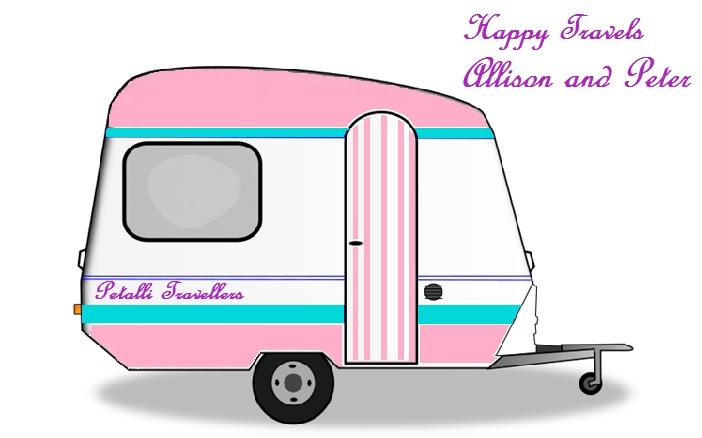 We have heard so much about this free camp that we had to see it for ourselves. What a great spot. First check in with the hosts to get a permit. 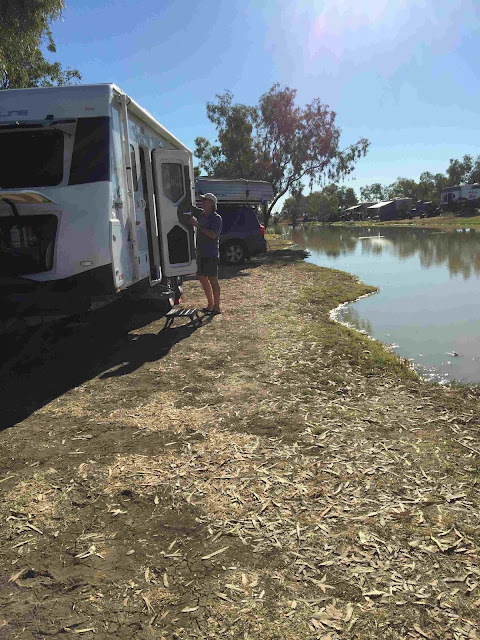 One has to be self-contained and only 96 hrs is allowed – 4 days – and if one has an Outback Mates card and extra two days can be obtained from the information centre. There is water available and bins and three bikes to borrow to ride along the bike track to town. We were able to get a site right on the Creek. 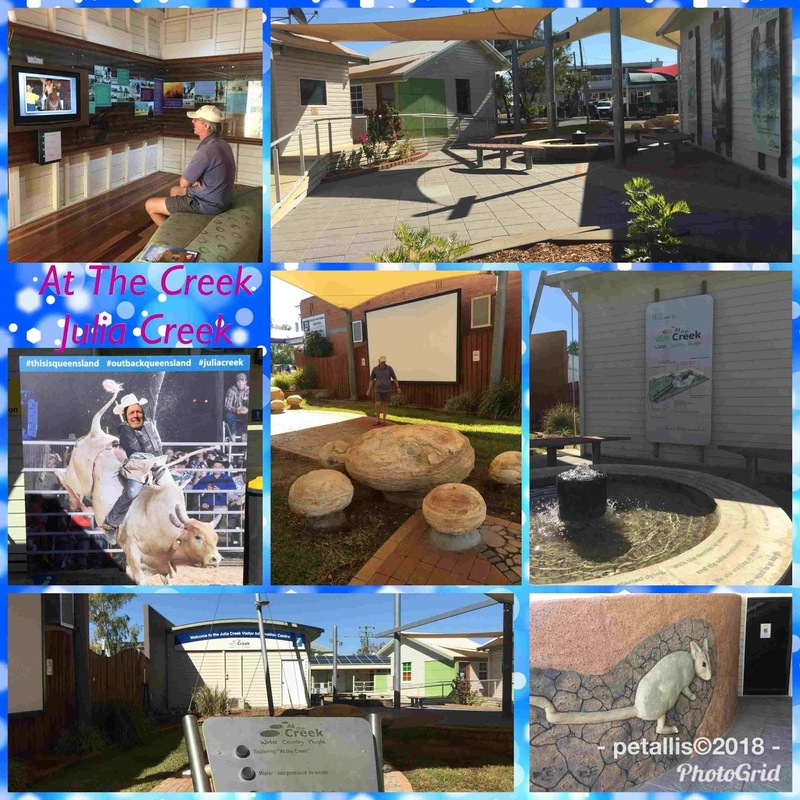 The information centre 'At the Creek' is a wonderful piece of architecture and so full of information. There are old workers cottages that now house photos and audio-visual displays. The old gaol houses a larger audio-visual room and the actual information centre. Outside the area is beautifully landscaped to depict the landscape of a river leading to and from the Artesian Basin, with large boulders -'moon rocks' – to provide seating and tables. There are two audio sections and a large screen. A really great area. The ladies in the info centre were were very helpful. 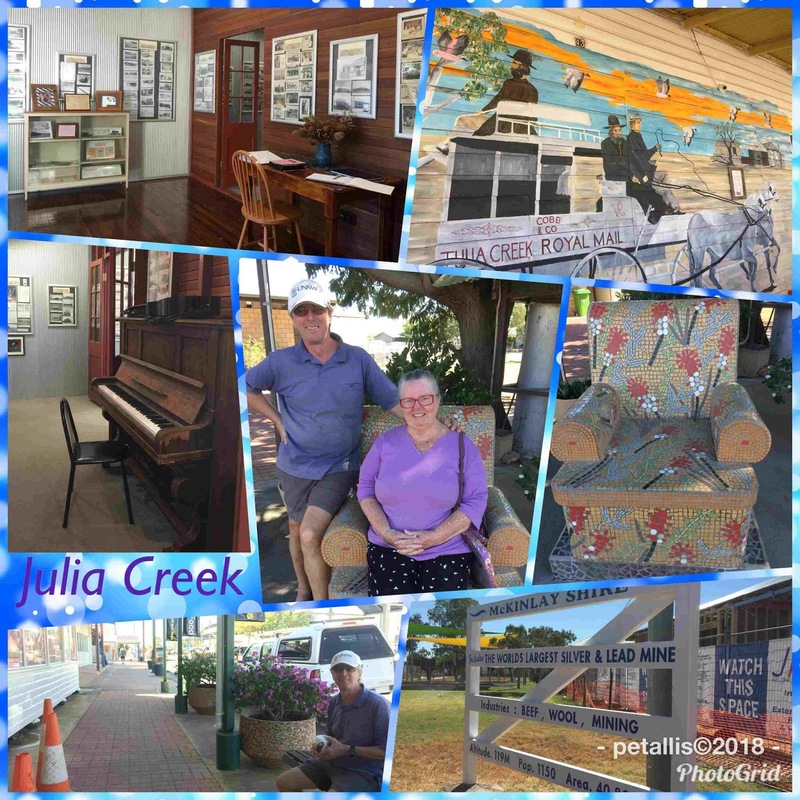 Julia Creek, originally known as Scorpian, was the first European settlement in north west Queensland and serviced the surrounding properties, and was a Cobb & Co. stop. Donald McIntyre came to the area in 1862 after travelling up the Darling River. He established a property named Dagonally about 70km for the present town. In 1870 the name of the town was changed to Julia Creek after McIntyre's niece Julia Campbell. We walked up and down the main street – as we do – and stopped for Peter to get his coffee fix which happened to be in the local 'Friendly Grocer'. I picked up some more Creamy Chocolate biscuits and some lemonade. We walked up to the old opera house which was opened on the same day as the Sydney Opera House. This one use to be in the hospital grounds and was moved and restored last year when the new hospital was built. Now it is located behind the Council Chambers and houses a lovely collection of old photos. It is also right next to the Artesian Bore, which supplies the town with water. Thee is also an interesting park that has a number of history boards, and a good playground. There are over 30 historical boards around the town. 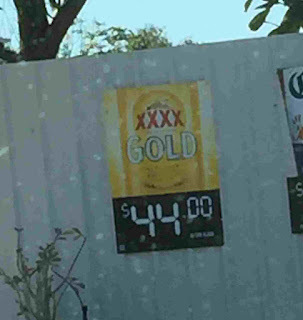 Julia Creek has the cheapest petrol up this end of the state, and also had the cheapest beer Peter has seen since Brisbane - so he topped upon both. Plans Keep Changing - But That's OK!! Wallumbilla and the Kelly Gang? Oops - did it again!